Here at Beauty Resource we love nothing better than a jolly good offer. Don’t you just love those moments when you walk up to the till and the cashier rings up the total to half the price you expected, or you’re at the Beauty Counter and the make-up artist slings a load of freebies in with your purchase? It really is satisfying. 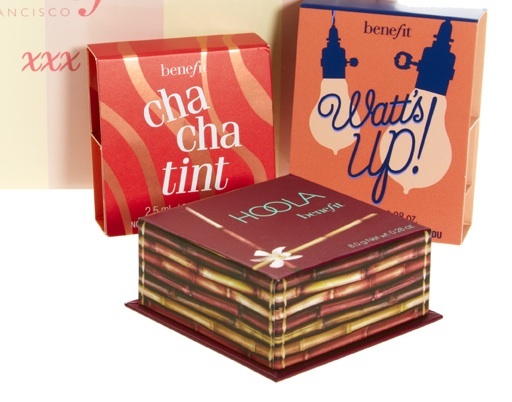 Well we were recently pursuing the Internet for great bronzers and we stumbled upon this amazing offer from Benefit, which gives you a full size Hoola bronzer (one of the best bronzers out there in our opinion) with good sized testers of both their newest lip and cheek stain Cha Cha Tint, and the Watt’s Up! Highlighter. Not only are these products all you need to achieve the coveted natural summer glow look that every girl tries to achieve during the warmer months, but you also have a great opportunity to try out some Benefit products you may not have used before. For an easy going summer day look, we recommend you pop on a nice even layer of your favourite tinted moisturiser before taking the Hoola bronzer and using it to contour and add shape to your cheekbones. Then take your Watt’s Up! Highlighter and use your finger or a concealer brush to highlight underneath your brow bone, the tip of your nose, your chin dimple and the very tops of your cheekbones. Complete the look by adding a pop of colour with the gorgeous mango coloured Cha Cha tint. Dot a little onto the apples of your cheeks and blend quickly before it sets. Finally, apply a moisturising lip balm and dot and blend some tint on top for a ‘your lips but better’ pout. If you are interested in picking up this Benefit bargain, head on over to ASOS now and snap one up for £23.50.